Tottenham produced a performance of maturity, steeped in belief to beat Bundesliga leaders Borussia Dortmund. It was a signature performance, writes Marcus Foley. Feature - Son has arrived as a Spurs superstar... so where are the wider plaudits? Mauricio Pochettino is a coach - and a man - who embraces the intangibles; whose belief system is steeped in positivity. A coach who, when he says, "we send Harry Kane positive energy" to expedite a return from his latest ankle injury, believes that that positivity will have said desired effect. Pochettino is a coach of belief; a coach who has been transformative for Tottenham. Yet, as harsh as it might seem, if one accusation could be thrown at his Tottenham, it is that when it mattered Spurs - unlike their manager - have lacked the belief in those clutch moments. Their mentality has been left wanting. There have been too many of those moments for it to be coincidence. Tottenham have both overachieved and buckled at crucial times. Pochettino himself, while not explicitly calling out his side's wanting mentality, has referenced it as the missing piece to continued growth and, ultimately, the trophies that have thus far eluded his tenure. Granted, Spurs have certainly developed in that area. Domestically they have shown an ability to grind out results with underwhelming performances, which hints at a maturing team. A side who believe, regardless of performance, in their ability to win - see recent wins against Watford and Newcastle. However, a Champions League fixture against Lucien Favre's Bundesliga-topping Borussia Dortmund promised an entirely different proposition. Die Borussen, like their manager, are meticulous in their build-up play, whose patience in possession cajoles their opponents into a false sense of security that they ruthlessly exploit with a sudden change of intensity. Indeed, the first half provided a thorough examination of Tottenham's Champions League credentials. The hosts shaded possession but failed to muster a single shot on target; while Dortmund fashioned four efforts on the goal of Hugo Lloris who produced two particularly fine saves to deny the visitors a lead at the interval. It was a fairly chastening half of knockout football for Pochettino’s side, and in some ways reminiscent of their game against Juventus at the same stage of last year's competition. The hosts might have had more of the ball but the visitors were more threatening with it. Their only failing in the first half was an inability to turn that threat into a goal. Spurs managed to achieve that feat within minutes of the restart through the effervescent Heung-Min Son, with Jan Vertonghen and Fernando Llorente putting further gloss on a signature performance late in the second half. 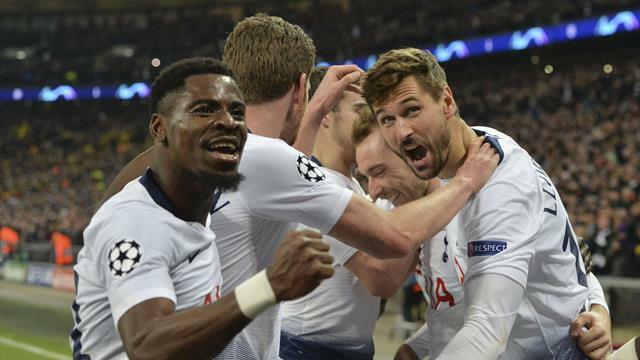 Granted, Tottenham have produced some excellent results under Pochettino, not least the 3-1 win over Real Madrid in last season's competition or this season's 1-1 draw with Barcelona at the Camp Nou that secured their progression to the round of 16 of Europe's elite competition. However, what perhaps marks this one out as different was the control and drive with which it was executed. The belief that the processes Pochettino has implemented would yield the desired result. The manager spoke in his post-match press conference of loving brave players, of players willing to take risks, and of players willing to make mistakes. The Tottenham manager reserved particular praise for 20-year-old Juan Foyth, a player, who due to the club’s homegrown player issue, failed to make their Champions League squad for the group stages. And this was a brave performance. It was not a performance devoid of mistakes but Tottenham were willing to continue taking risks at 0-0, 1-0 and 2-0 to try to put the tie beyond the Bundesliga leaders. A club - rightly or wrongly - with a moniker of Spursy, went after a Dortmund side set up to - and fully capable of - hitting them on the break; they turned the screw – all the while without their talismanic duo of Dele Alli and Harry Kane. It was a performance of maturity, and one steeped in that intangible of belief. There will be sterner tests of Tottenham’s mentality, not least the return leg on March 5 at the Signal Iduna Park where Dortmund will invariably throw every last thing they have at them but on Wednesday night's showing Tottenham will be ready.